Yes! If you buy pulses in the dry form vs the canned, you will save so much money. Not only that, but you also don’t get the added sodium that you would from canned foods. A serving of lentils cost 10 cents to quinoa’s 59 cents! If you are unfamiliar on how to prepare dry beans, you can check out this post. Please take the Pulse Pledge with me – a 10 week commitment to eat more pulses (at least once a week) in 2016! You can start with this hearty stew! There are also loads of other recipes to choose from as well. 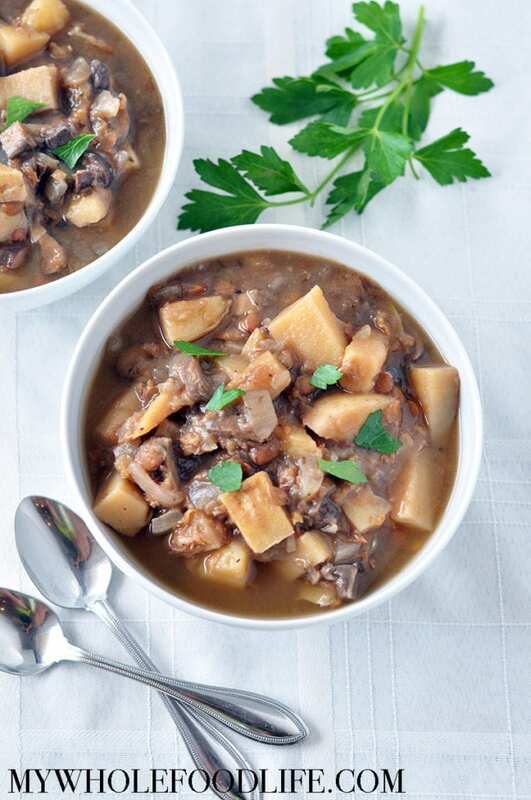 This hearty soup is packed with good for you ingredients like lentils and mushrooms! I can't wait to make this! I will try with the spinach as well !! How long did it take stove top? Melissa Tell me please what is a baby Bella mushroom. Wondering if it is similar to portobello?